Panellists at The Star Property and Home Fair 2008 Roundtable discussion in Penang. (From left) Hunza Properties Bhd executive chairman Datuk Khor Teng Tong, Ivory Properties Group executive director Datuk Seri Nazir Ariff, Ho Chin Soon Research Sdn Bhd managing director Ho Chin Soon, Rehda Penang chairman Datuk Jerry Chan, Star Publications (M) Bhd deputy news editor (business) Angie Ng and executive director Datuk Seri Kamal Hashim, Penang Town and Country Planning and Housing Committee chairman Wong Hon Wai, Henry Butcher Malaysia (Penang) director Dr Teoh Poh Huat, IJM Corp Bhd deputy managing director Teh Kean Ming, SP Setia Bhd executive director Datuk Voon Tin Yow and Mah Sing Group Bhd executive director Lim Kiu Hock. Penang’s property landscape is undergoing rapid transformation with the people’s changing lifestyles and evolving market dynamics. The recent declaration of George Town as a UNESCO World Heritage Site has given a new drive and inspiration to the state government and property developers to further uplift Penang’s image as a real estate destination. StarBiz deputy news editor ANGIE NG recently met up with key property players at The Star Property and Home Fair 2008 roundtable discussion in Penang to gauge the state’s market prospects and challenges ahead. The panellists were Penang Town and Country Planning and Housing Committee chairman Wong Hon Wai, IJM Corp Bhd deputy managing director Teh Kean Ming, SP Setia Bhd executive director and chief operating officer Datuk Voon Tin Yow, Real Estate and Housing Developers’ Association Penang chairman Datuk Jerry Chan, Mah Sing Group Bhd executive director Lim Kiu Hock, Ivory Properties Group executive director Datuk Seri Nazir Ariff, Henry Butcher Malaysia (Penang) Sdn Bhd director Dr Teoh Poh Huat, Hunza Properties Bhd executive chairman Datuk Khor Teng Tong and Ho Chin Soon Research Sdn Bhd managing director Ho Chin Soon. StarBiz: What is the state government’s blueprint for Penang’s development and how is it meeting the needs for conservation, especially with UNESCO’s recent declaration of George Town as a World Heritage Site? Wong: We have formed an advisory panel comprising of heritage architects and non-governmental organisations. They are providing us input on how to improve our heritage plans. When we talk about heritage conservation, it’s not only for tourism but for an organic community as well. It’s pointless to have buildings without occupants. Teh: The state government should take advantage of its heritage city status to promote local properties. This is why it is necessary to raise the standard of the properties in Penang so that they are on par with international standards. Tourists visiting Penang for heritage tours can also take the opportunity to view the livable sites of the island. If they find our properties in line with their requirements, they will invest. Penang must retain its uniqueness, and should not be made into another Hong Kong and Singapore. Chan: We need to reaffirm and rejuvenate Penang. Some 200 years ago and even 50 years ago, Penang was still a reputable commercial centre. That was why well-known international banks chose to set up in Penang. We have our 7 ‘Cs’ that can be further strengthened to attract tourism. They include cuisine, culture, care, choice, community, and connectivity. We have diversity in food; heritage and history in culture; hospitals, beach, hills; quality properties and education system; and an international airport and port. We also need to create a new industrial estate in Seberang Prai to capitalise on the development of the second Penang bridge, and look into transforming Batu Kawan as a Seberang Jaya. Lim: The heritage areas should be turned into pedestrian only areas so that they are more tourist friendly, as well as conservation friendly. A good example is Venice, Italy. It is considered the greatest pedestrian city in the world because of its large pedestrian street network completely free of cars. The city is quite dense, yet is one of the most relaxing and pleasant cities in the world. Another case in point is Copenhagen, where the main street was transformed into a pedestrian thoroughfare 40 years ago. In line with the transformation, city planners have taken numerous small steps to transform the city from a car-oriented place to a people-friendly one. Their research shows that these initiatives have created four times more public life. Creating more public life would add value to Unesco’s declaration of George Town as a World Heritage Site, as more people would be able to enjoy the area whilst at the same time, conserve the heritage. Whilst Penang is renowned as an international manufacturing hub, there needs to be more commercial and tourism projects to complement the island’s growth. For example, 5-star hotels, service apartments, lifestyle malls and offices would breathe new life to the island, especially in the new growth corridor in the south. Nazir: More can and should be done such as working closely with housing developers if they want to implement their plans. The World Heritage listing is a great branding tool and those who love old buildings and culture would want to settle down here. The state government’s recently set up Heritage Steering Committee must work hand in hand with the local government to enforce the heritage guidelines. We should take advantage of the listing and get the pre-war house owners to maintain their properties based on the established guidelines and standards. Owners should be given tax exemptions if they invest in the restoration of their properties. For those who cannot afford it, soft loans should be made available to them. The state government should be strict in enforcing the heritage guidelines or else, George Town will lose the UNESCO recognition. Starbiz: What are the state’s plans and initiatives to further lift the living environment and property landscape in Penang? Wong: There are certain aspects of the state development plans, which are currently under scrutiny. Not everything is cast in stone. If we need to amend the plans in order to meet the people’s expectations, we will do so. Our guiding principle is CAT which stands for competency, accountability and transparency. We’ll call on the industry players to get their feedback. Penang has a vibrant civil society. The government has to balance the interests of the community at large and the future generation. We are currently formulating and regulating the housing policy. Our goal is to have quality and affordable housing. We are also looking at five to six initiatives to relocate the squatters in several areas including Tanjung Tokong, Jelutong, Mak Mandin and Tasek Gelugor. We have also initiated changes in the land policy. The processing of land applications is now faster than it used to be. Of course there are bad apples among the developers. There are 26 abandoned projects in Penang. We are hoping that a white knight will come to the rescue. For developments above 250ft above sea level, they have to go through the State Planning Committee, which will handle them on a case-by-case basis. Starbiz: What is the outlook for Penang’s property market in the next few years from the perspective of supply and demand, price trends and growth projections? Ho: The state’s property outlook is good and the state government should allow more high-density projects, as land on the island is scarce. More people can then own homes and these projects do not take up much land if compared to building rows and rows of terrace houses. Imagine a situation where for the same density and plot ratio, we can have multi-storey buildings and at the same time, we can have open spaces and fields. The state’s property has the second highest capital gain in the country after Kuala Lumpur and is ahead of Selangor. But in order to make the state more attractive to property investors, the transportation problem has to be solved and the building of Light Rapid Transit (LRT) could be the answer. The state has so much to offer homeowners but is restricted by outdated guidelines, which they should be comprehensively reviewed. Voon: The country’s economic fundamentals are strong. Politically, Malaysia is still considered stable compared to some others in the region. 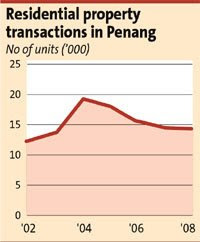 The lack of land bank in Penang will continue to push demand for landed properties to go up. Some good condominium projects in selected locations will still do well despite the fear of an economic downturn. The property market still looks good in the next one to two years. Lim: We need more innovative developments with better designs and concepts to value-add to the property and lifestyle of the people. We are seeing more of these projects by developers from Penang and Klang Valley. Penang has a clear advantage because it has the second highest urbanization rate in Malaysia, the second highest average monthly household income which is higher than the national average as well as being a tourist attraction for foreign investors. The outlook is still healthy for the next few years but developers have to work harder to develop good concepts and products, and work harder to ensure good take-up. StarBiz: What are some of Penang’s strengths and shortcomings in its effort to become a top real estate destination? Chan: The new state government has initiated needed reforms on land matters, and the Chief Minister is now in charge of land matters. This has not happened for a very long time. He has removed unnecessary ad hoc committees to bring about faster approvals, and initiated reforms such as allowing for leasehold land to be converted to freehold status. To foster development in Penang, however, one must look beyond faster approval for layout plans and land matters. We still see impediments stalling the approval of engineering plans. We need to allow commencement of work to kick off without unnecessary delays. Assignment of approvals must also be allowed to practice in Penang, as in other councils and in other states. This means that those developers who have taken over other people’s projects should not have to apply for approval of the building and layout plans all over again. The state government needs to work closely with the private sector to drive economic growth. It must also be bold to take up the right decisions, which may not always be popular. Popular decisions, however, may not always be right. Lim: Preliminary work on the project site should be allowed without approvals. Preliminary work such as land clearing activities and erecting a show house now have to wait for months for approval. The Chief Minister should also use his discretionary power to fast track the approval of beneficiary projects, which can generate earnings from foreign exchange and spur the development of satellite towns. The state government should also look into giving approvals for development on hill land where the soil and terrains are right. Khor: The state must also seriously look into allowing development on hillside land, which is above the 75m limit. Hong Kong has successfully developed hillside land and the government there has a Geology Technology (Geotech) Unit to study such land for development. Penang should have a similar unit, as the terrain of Penang and Hong Kong are very similar. Nazir: The state government’s strength is its Competence, Accountability and Transparency (CAT) governance philosophy that will make Penang cleaner, less congested and more livable. Shortcomings include the endless red tape that developers have to go through just to get approval and the time they take for an application to be approved. A developer should be able to know the status of its application in three months. We need practical guidelines conducive for sustainable development. Local and structure plans need to take into account the views and aspirations of everyone, developers included. I know that the state government cannot be held responsible for this state of affairs but they should work closely with us to understand our problems. More importantly, most developers also live here and the problems here are also our problems. Voon: Penang’s properties are generally a lot more expensive that those in Kuala Lumpur. The reason is the shortage of land and the reason behind the high prices is not because people here are rich. On top of that, a development above 250ft above sea level is a no-no. In Hong Kong, hillside developments are allowed. In relation to height, we should also look at the slope. If the development is on high ground but the slope is gentle, the plan should be given due consideration. This will help solve the land scarcity problem. Driving around, I also see a lot of squatters. This problem has been there for years but there’s no solution because politicians don’t deem it as their problem. Another shortcoming is the transportation system in the state. Although the monorail and Penang Outer Ring Road (PORR) projects have been deferred, there are other options that we can look at, like the viability of a tram system. Penang used to have trams as a means of transportation in the early days. If we can introduce this again, we can bring back the glory days of Penang as an attractive tourist destination, besides solving road congestion problems in the state. Also, one way of attracting foreign investors is to increase the rental property market. It is difficult to calculate the market value of a property. It’s better to give value in terms of rental value. The state government can also consider rezoning and relocating the existing industrial zone on the island to the mainland. By providing attractive incentives, I’m sure the multinational corporations will agree to move. Starbiz: What is Penang’s potential for developers and real state investors - what are the property trends to meet the new lifestyles of the people and where are the new growth corridors? Voon: The state definitely has potential. It has low unemployment rate, and steady gross domestic product coupled with balanced and equitable national economic development that point to greater opportunities for property development and the investment market. The trend at the moment is housing developments with lifestyle concepts. Conventional designs are a thing of the past. Developers today are required to provide more such as quality finishings, services like gated and guarded living, extended warranty etc. These features are what locals and foreigners are looking for. Developers must also address security issues nowadays as it is becoming increasingly important all over the country. Lim: Penang is the third largest growth corridor after the Klang Valley and Johor. Due to the limited supply of land in the north, housing development has shifted to th e south, for example to Batu Maung and Balik Pulau. This is the new growth corridor for Penang. The trend has shifted to luxurious developments with a resort feel, and most newly launched projects are gated and guarded. Gated and guarded projects with good concepts and security systems are appealing as people want some privacy and security, within a close and friendly neighbourhood. Some of these properties include three generation homes, which have three-storeys, large-built-up areas, and many rooms. To market these products at a premium, developers would have to provide more facilities and supplementary services as the customers now have higher expectations. Like Singapore, Penang attracts tourists who make this a stop-over base for them to explore other areas be they in Malaysia or around the region. One more trend that’s increasingly evident is the inflow of foreign purchasers under the Malaysia My Second Home (MM2H) programme. Since it was launched in 2001, MM2H participants have increased from 313 in 2001 to over 1,500 in 2007 and to-date, there are more than 10,000 expatriates living in Malaysia under this programme. Interestingly, Penang has the highest number of MM2H participants in Malaysia. Teoh: The residential market is the biggest component, contributing between 60% and 70% of the total volume of transactions over the years in the real estate industry. At night, we don’t see lights in many homes, which could mean they are unoccupied. This shows that Penangites may have more than one home. Globalisation is here and we have no choice but to meet it head on. Penang has all the allure of a good place to live - the beaches, the hill and the people. It’d be a shame not to capitalise on all these factors. Starbiz: How is the quality and project type available in the market now and what should be done to raise the state’s real estate potential and profile internationally? Khor: Penang properties should be marketed in tandem as a resort destination and World Heritage site to potential Malaysia My Second Home (MM2H) owners. Currently, Koreans come to Penang to learn English and Mandarin. Industry players should exploit this situation to our advantage and get them to stay here. Pre-war house owners must be given a free hand to do what they want with their properties. They can turn their properties into shops, homes or SOHOs (small office home office) in accordance with the heritage guidelines. The state government should seriously consider sending people out to study cities like Milan, an Italian heritage city, and Shanghai, to learn from them. These are hugely successful heritage cities. Penang has many good housing projects like those in Gurney Drive and Tanjung Bungah but most of them are owned by foreigners. Many of these projects costing millions are beyond the reach of locals. Teoh: We can bring in the overseas market with the help of the private sector and through government support efforts. There are still a lot of things that need to be done. There is no such thing as one size that fits all. We need to understand who are the potential MM2H applicants and why they are choosing Penang. Then only can we cater to their needs. Most of their household sizes are between one and two people. They don’t want to buy a 700 sq ft unit nor do they want a 4,000 sq ft home. There are hardly many properties, which provide a suitable size for their requirement. Thus, I urge the government to be more market driven rather than regulatory driven. The property market is going through several challenges such as inflation and weakening demand. When we look at the challenges, some can be controlled, some need the help of the authorities while others can’t be controlled as they are caused by world events. Voon: The availability of quality products are still far and few, while the product range is still very limited, mainly restricted to the standard two-storey mass housing, apartments and recently luxury high-risers termed super-condominiums. The government should look into land and immigration laws to raise the state’s real estate potential and profile internationally. Our MM2H programme offers a 10-year visa, which is not attractive to some foreigners. They are not comfortable with this because the policy may change anytime the government deems fit. It is not so concrete compared to other countries like Australia and New Zealand where investors with a certain amount of investment get permanent residence status. Perhaps we should look at something like this for foreign investors if we want to attract high net worth and high skilled investors. KSL City, which is KSL Holdings Bhd’s latest mixed development in the Iskandar Malaysia growth corridor, is set to be a new landmark in Johor Baru when it is completed in two years. Touted as the biggest commercial complex in the whole of Johor, the project consists of a four-storey podium block of retail complex, two blocks of 26-storey hotel tower with a total of 950 rooms and 355 apartments on two blocks of 33-storey tower. The podium complex, with floor area of 500,000 sq ft, will comprise retail outlets, a department store, cineplexes and car parks. The RM500mil project is located within the matured Century Gardens just opposite Holiday Plaza shopping complex near Jalan Datuk Suleiman. Ku Hwa Seng (left) and Khoo Soon Lee Realty Sdn Bhd general manager Ku Keng Leong with the model of shop offices to be developed at the company's Taman Nusa Bestari project. “The location of KSL City augurs well for the company and it is the last remaining piece of land in the city for such a project,’’ said KSL Holdings executive director Ku Hwa Seng. KSL City is located just about two kilometers from the Johor Baru central business district (CBD) and the new Johor Baru Custom, Immigration and Quarantine (CIQ) complex. Ku said the five-star hotel would be known as the KSL Resorts Hotel and would be managed by a local hospitality management company. The podium block and the hotel towers are expected to be completed towards the end of next year and the apartment blocks in mid-2010. The apartment blocks will have separate entrances and car parking bays from the hotel towers. Every apartment will have an individual private lift. “This is the first such development in Johor that combines retail, hospitality and high-rise residential living like those in Kuala Lumpur and Singapore,’’ he said. Ku said the company was confident the hotel would do well, considering that most hotels in the Johor Baru CBD were recording almost 90% occupancy rate. “Johor will also benefit from the two integrated resort projects (IR) coming up in Singapore in two years. “Malaysians and foreign tourists planning to visit the resorts in Singapore would probably stay in Johor Baru as the hotel rates in Singapire are too costly for the average visitors,” Ku said. Presently, Singapore is facing a shortage of hotel rooms and the average room rates at S$280 could further increase to S$500 by the time the KSL hotel is completed. “We plan to have a tie-up with the two Singapore casino operators to provide shuttle bus services from KSL City to the two resorts,’’ he said. Ku said the Singapore Tourism Board has projected that some 17 million tourists would visit the island state next year. As for the apartments, KSL would be looking at Malaysian professionals and expatriates working in the republic as potential buyers. “Similar apartments like what we are building would carry a price tag of over S$500, 000. The price advantage will be the main reason for the people to stay in Johor Baru and work in Singapore. “It is a well known fact that Johor and Singapore have been complementing each other economically for long,’’ he said. Ku does not discount the possibility that the KSL City project could be a stepping stone for the company to further expand into the retail and hospitality sector. KSL Holdings Bhd sees strong growth prospects in the Iskandar Malaysia growth corridor and is looking to expand its exposure and landbank there. The Johor Baru-based company currently has four ongoing integrated developments located in the corridor – Taman Nusa Bestari on 91.9ha, Taman Bestari Indah Ulu Tiram (283.3ha), Taman Kempas Indah (95.9ha) and KSL City (2.73ha). Upon completion in eight to 10 years, there will be 18,300 mixed residential and commercial properties worth a total gross development value of RM3.7bil. “These projects will contribute up to 70% of group revenue and earnings in the current financial year ending Dec 31. “Despite the sceptical views by certain quarters on the progress and benefits of Iskandar Malaysia, we are confident that the corridor has great potential, going forward,” executive director Ku Hwa Seng told StarBiz. Iskandar Malaysia, formerly known as Iskandar Development Region before the name change in April, would be two years old in November. The growth corridor covers 2,216.3 sq km within the southern-most part of Johor covering Johor Baru city centre, Nusajaya, Pontian-Gelang Patah, Senai-Kulai-Skudai and Pasir Gudang-Tanjung Langsat. Ku commended Khazanah Nasional Bhd for having done a good job in promoting the growth corridor locally and internationally. Iskandar Region Development Authority has secured RM33bil investment, representing 70% of the total investment target of RM47bil for the period between 2006 and 2010. “KSL’s projects will be one of the main beneficiaries of the spillover effect of Iskandar Malaysia and Singapore,” he noted. He said KSL would benefit from Iskandar Malaysia in view of the company’s niche market and strong brand in the Johor property scene. As of last December, KSL has over 809.371ha of landbank in Johor Baru, Batu Pahat, Kluang, Segamat, Mersing and Muar. Of the total landbank, 60% are located within Iskandar Malaysia. Ku said the land’s close proximity to the Senai Airport, the Port of Tanjung Pelepas, North-South Expressway and the Senai-Desaru Highway was a boon for the company. The airport, the port and the highways are touted to be interlinked and will be developed into part of the transportation hub in Iskandar Malaysia. About 80% of the land are available for immediate development as they have been granted approval for subdivision. Together with the Maharani Riviera in Muar, the company’s projects in Johor have a combined gross development value of RM4.4bil, which will keep it busy for the next eight to 10 years. Taman Nusa Bestari benefits the most, as the scheme is located just a few kilometers from Nusajaya where the Johor State New Administrative Centre is being built. Nusajaya and its nearby areas are in for a boom as many development projects are being built and new ones in the pipeline. Ku said when the company launched its three-storey shop offices in Taman Nusa Bestari in 2002, they were priced around RM300,000. “Now, we are selling a similar unit at RM800,000 to RM1mil while the bigger units are priced at more than RM2mil,” he said. Besides its traditional market in Johor, KSL is also looking to expand into the Klang Valley with the recent purchase of two parcels of land totalling 180.6ha in Klang, Selangor, for RM156mil. The land is located along Jalan Klang-Banting within the Blackwater Estate about 15km from Klang town centre. Ku said the company planned to develop its land in Klang into a mixed project with a gross development value of RM1.5bil. The project is targeted for launch early next year and will take eight years to complete. Ku said the acquisition served as a platform for the company to tap into the Klang Valley property market. “Our land in Johor and Selangor will help us sustain our medium to long-term growth and profitability,”he said. On how KSL, being a Johor-based developer, could convince house buyers in the Klang Valley, Ku said: “Regardless where they are, purchasers are more or less the same. “If you give them better quality products and good facilities, they will consider buying from you,” he said. GOING international and attracting foreign property investors will be gaining momentum among developers as they look to tap the vast offshore market for their properties. Industry players are realising that they have to widen their target market to beyond Malaysia’s shores to make up for the slowdown in local demand following rising inflationary pressures and prevailing cautious sentiment among potential property buyers. Property developers who participated at The Star Property and Home Fair Penang 2008 roundtable discussion in Penang recently concurred that the foreign factor was the much needed link to promote greater buying interest in a more sustainable market for Malaysia’s real estate. The three-day exhibition from Sept 5 will be held at the Penang International Sports Arena. They also voiced their apprehensions over the state’s restrictive development guidelines, including the low plot ratio and restrictions on development at more than 250 feet above sea level. To overcome a shortage of development land in land-scarce Penang, SP Setia Bhd executive director and chief operating officer Datuk Voon Tin Yow suggested more mixed use integrated developments with residential, commercial and leisure components be allowed. This is because such projects would free up more land for better use, including landscaping and greening purposes. He also said development plans on land above 250 feet should be given due consideration if the slope of the land is gentle. The panellists also voiced the need for clearer guidelines for development in inner city George Town, especially around the buffer zones, to ensure a more optimum balance between restoration and development efforts. They opined that a more efficient public delivery system with progressive and transparent guidelines and processes would contribute greatly as speed and timing are important attributes for projects to succeed. According to Ivory Properties Group executive director Datuk Sri Nazir Ariff, it would be easier to formulate financial plans and projections if industry players could be assured of transparent governance. Penang Town and Country Planning and Housing Committee chairman Wong Hon Wai, who also took part in the roundtable discussion, assured the developers that the new Penang state government would adopt the kaizen or continuous improvement approach in its civil service in line with its competence, accountability and transparency (CAT) governance. “Where property development is concerned, we want to ensure Penang does not turn into a concrete jungle but will grow as an organic city with a soul,” Wong said. Real Estate and Housing Developers Association (Rehda) Penang chairman Datuk Jerry Chan said more needed to be done to promote Penang’s many attributes to the world, including building up a strong branding as an international real estate destination. “There is also a need to rejuvenate the inner city of George Town to its old glory as a lively and liveable city,” he said. Nazir said the declaration of George Town as a United Nations Heritage Site in July was a great branding opportunity for Penang and more cohesive efforts were needed between developers and the state government to leverage on the state’s unique charms. He urged the state government’s Heritage Steering Committee to work hand-in-hand with the local government and developers when enforcing and implementing the heritage guidelines. IJM Corp Bhd deputy managing director Teh Kean Ming said while Penang’s property market offered much potential for developers and investors, the onus was on industry players to work with the authorities to elevate the state’s profile in the international real estate arena. “There is a need for more world-class products and infrastructure, such as waterfront developments, that appeal to savvy high-net worth foreign buyers,” Teh said. Concurring with Teh, Henry Butcher Penang director Dr Teoh Poh Huat said current thinking seemed to focus on leveraging on foreign demand as a panacea for the more challenging domestic market. “Making Malaysia a destination of choice for property investment and a second home is now the sine qua non. “As this sector of the market is relatively less understood, it is imperative to conduct research to understand both the demographic and psychographic elements of the foreign market on the country’s real estate,” Teoh said.